The sun’s heat bears down on a desolate prairie dog colony in America’s Great Plains. Small mounds of dirt mark the entrances to an intricate network of tunnels below the surface. This is the grim discovery for many biologists returning to study colonies that were thriving only weeks ago. These are the Dark Ages for prairie dogs in the American West. Considered a keystone species, black-tailed prairie dogs are an essential part of the American Grasslands. Their tunnels help fertilize the soil and provide shelter for nesting birds. Many predators rely on prairie dogs as a food source. But the plague’s 100 percent mortality rate is shattering this delicate balance. The plague evolved in Central Asia and made landfall in the United States in 1900 when trade ships from Hong Kong carrying infected rats docked in San Francisco. The plague spread rapidly throughout the American West where native species like prairie dogs had no immunity to the exotic disease. Disease researcher Dan Tripp is testing a new vaccine that protects prairie dogs against the plague. The vaccine is fed to the prairie dogs using pellets that are scattered across the colonies. The problem is getting to the prairie dogs before the plague does. Climate change influences the frequency and severity of plague cycles. Rising temperatures throughout the American West have led to severe droughts and wildfires in some regions and devastating floods in others. This sporadic climate could impede vaccination efforts. Tripp explained that as the climate wavers between extremes of above average rainfall and droughts, it becomes more difficult for scientists to predict and prevent plague outbreaks. To understand how climate and plague outbreaks are linked, some scientists are finding their answers with the fleas — the culprits for spreading the plague from one host to another. If there are more fleas, the chances that one of them is carrying the plague are greater. A popular theory argues that plague outbreaks follow wetter and cooler years, when it’s assumed that fleas and rodents are more abundant. But new research shows that fleas increase during droughts, meaning that a warmer, drier climate could increase the severity of plague outbreaks in the American West. Wildlife ecologists David Eads and Dean Biggins counted the amounts of fleas on prairie dogs during wet and dry years to understand how climate affects flea abundance. The common assumption is that plague outbreaks are more likely during wet years when there are more fleas. To their surprise, they discovered that during a drought in New Mexico the amount of fleas on prairie dogs increased by nearly 200 percent. “When you have a drought period, flea numbers might escalate on prairie dogs,” Biggins told The Ecologist. “And as fleas get more abundant, this could increase the circulation of plague. In their study, Eads and Biggins conclude that a lack of food and water during droughts might weaken prairie dogs’ defenses against parasites that spread the plague. They observed that the fatter, healthier prairie dogs had fewer fleas compared to others that were starving. The study explained that female fleas that feed on starving rodents tend to produce more eggs and larvae. 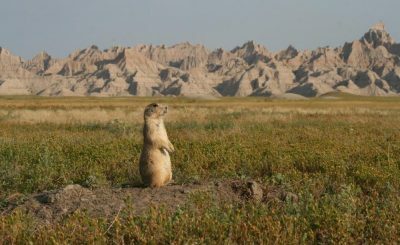 In light of climate models that forecast frequent droughts, prairie dog colonies in the American West could be at greater risk of plague outbreaks. When the plague arrived in the American West in 1900, newspapers were abuzz with speculations about where the plague would hit next. People knew that fleas spread the plague, but those living in the frigid highlands of the Rocky Mountains believed that the fleas could never survive at such high altitudes. Mountain towns in the American West seemed safely out of reach. As the climate continues to warm, northern and high altitude regions that were too cold will become tolerable for fleas and other parasites. A similar trend is seen with the northward spread of ticks in America, leading to more outbreaks of Lyme disease in the central United States and Canada. On the Hawaiian island of Kaua’i, climate change is accelerating the spread of mosquito-borne diseases like malaria into ecosystems in higher elevations, where cooler temperatures are no longer a defense against infectious diseases. Megan Friggens, an ecologist for the United States Forest Service, said that plague could spread into northern regions of the American West where warming temperatures allow fleas to survive and breed longer. This increases the amount of fleas and the chances for plague transmission. But Friggens explained that as northern climates become more tolerable for the plague, southern states might become too hot for the plague to survive. Justice Burnaugh is a freelance journalist living in the Colorado Rockies. He’s been interested in the plague since an outbreak struck a prairie dog colony near his home.